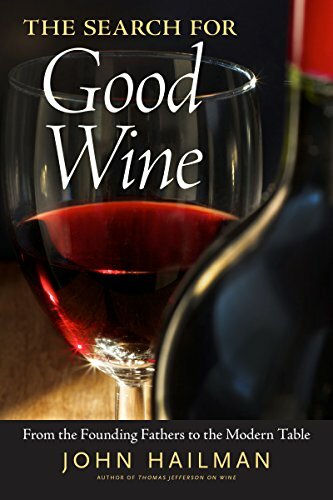 The Search for Good Wine is a highly entertaining and informative book on all aspects of wine and its consumption by nationally-syndicated wine columnist John Hailman, author of the critically-acclaimed Thomas Jefferson on Wine (2006). Hailman explores the wine-drinking experiences and tastes of famous wine-lovers from jolly Ben Franklin and the surprisingly enthusiastic George Washington to Julius Caesar, Sherlock Holmes, and Ernest Hemingway among numerous other famous figures. Hailman also recounts in fascinating detail the exotic life of the founder of the California wine industry, Hungarian Agoston Haraszthy, who introduced Zinfandel to the U.S.
Hailman gives calm and reliable guidance on how to deal with snobby wine waiters and how to choose the best wine books and travel guides. He simplifies the ABCs of wine-grape types from the delicate pinot noirs of Oregon to the robust malbecs of Argentina and from the vibrant new whites of Spain to the great reds (old and new) of Italy. The entire book is dedicated to finding values in wine. As Hailman says, "Everyone always wants to know one basic thing: How can you get the best possible wine for the lowest possible price?" His new book is highly practical and effective in answering that eternal question and many more about wine. A judge at the top international wine competitions for over thirty years, Hailman examines those experiences and the value of "blind" tastings. He gives insightful tips on how to select a good wine store, how to decipher wine labels and wine lists, and even how to extract unruly champagne corks without crippling yourself or others. Hailman simplifies wine jargon and effectively demystifies the culture of wine fascination, restoring the consumption of wine to the natural pleasure it really should be. If you have any questions about this product by University Press of Mississippi, contact us by completing and submitting the form below. If you are looking for a specif part number, please include it with your message.